Published in: Harvey, W.H. (1860). 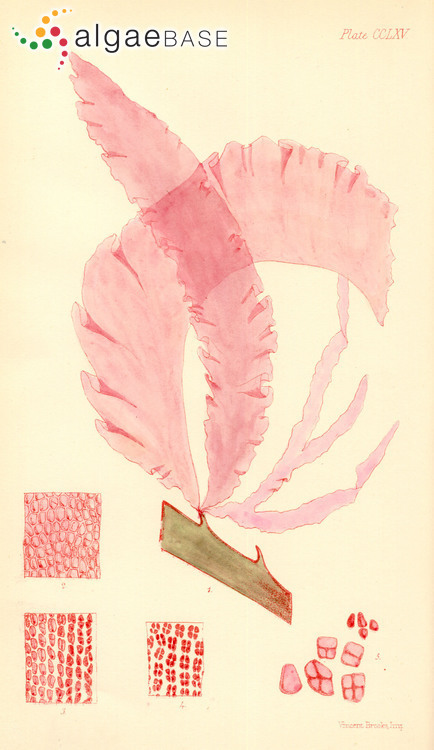 Phycologia australica: or, a history of Australian seaweeds; comprising coloured figures and descriptions of the more characteristic marine algae of New South Wales, Victoria, Tasmania, South Australia, and Western Australia, and a synopsis of all known Australian algae. Vol. 3. pp. viii, Plates CXXI-CLXXX (with text). London: Lovell Reeve & Co..
Index Nominum Algarum notes 'woolhousiae' has also been used for the specific epithet of this species. Type locality: Tasmania (Womersley 1994: 37). Type: Miss Woolhouse; on Macrocystis pyrifera. Notes: Illustrated by Harvey (1863, pl. 265, fig. 1) (Ricker, 1987). Womersley (1994: 37) notes that the type material is located in TCD. South America: Argentina (Boraso de Zaixso 2013), Chile (Ramírez & Santelices 1991), Falkland Islands/Islas Malvinas (Papenfuss 1964), Temperate South America (Ramírez & Santelices 1991). Australia and New Zealand: New Zealand (Adams 1994, Nelson 2012), South Australia (Womersley 1994), Tasmania (Womersley 1994), Victoria (Womersley 1994). Antarctic and the subantarctic islands: Macquarie Island (Ricker 1987 ).